Looking for a great date idea? Or maybe 15? Rhode Island is full of all the classic romantic destination ideas: A walk along the beach, a stroll in the park, a dinner for two. Grab your loved one and start exploring the Ocean State! 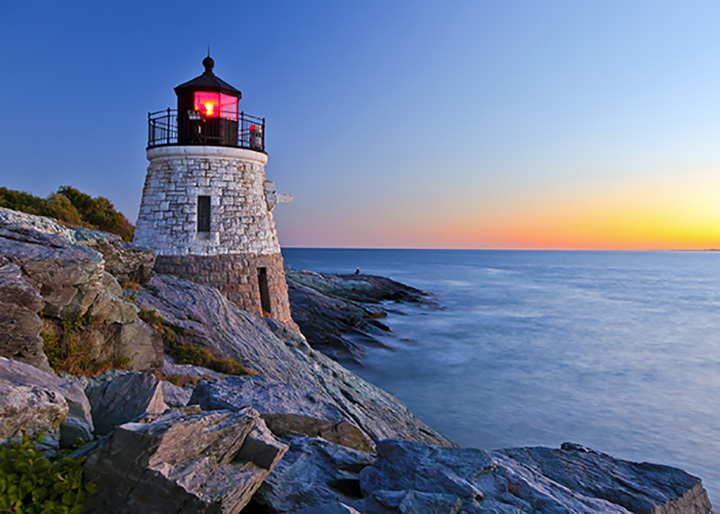 Enjoy the beaches of this small Rhode Island town while the sky turns orange with twilight. Looking for a great romantic getaway in this area? Try Ocean House for your hotel, which includes a spa and amazing brunch meals. Beaches, lighthouses, that small-town feel—Narragansett has all the marks of a beautiful romantic destination. Making a weekend out of your trip there? Book a reservation at The Break, a chic hotel not far from the Point Judith Lighthouse that also features a rooftop lounge. Staying around the city, but still want to find somewhere lovely to take your date? Step out onto the docks of India Point Park and watch the sunrise over the park. Though small, this park is perfect for a simple stroll. Located in DownCity, this charming little street is always strung with fun lights and has a cozy New England feel. Grab a cup of coffee over at Small Point Café or treat your date to a meal at Circe, a stylish space for American food. This is a popular destination for weddings. Visit once, and you’ll understand why. The park marks the location of the first lighthouse to grace Rhode Island with its presence. Hang out, take a walk, or enjoy a picnic with your loved one. This yacht-filled, seafood city is a great romantic destination. Walk along the beaches or tour some of the infamous Newport mansions—open all year round. Then grab dinner at The Mooring Seafood Kitchen and Bar, which has direct views of the water. Located right on Dorrance Street, you’ll recognize this elegant restaurant from its tall, ornate ceilings and high-backed chairs. It’s known for great cocktails, so maybe just stop by for drinks if can’t splurge for their decadent dishes. Does nature get you in the mood for romance? If so, take your loved one on a bike tour of Rhode Island along the East Bay Bike Path! Take it all the way from Providence and maybe even end up in Newport. Slater Mill was once an important historical site during the industrial revolution. Now it’s a popular destination for weddings! Tour the charming grounds of the old mill with your partner, and maybe even stop inside the mill itself! This landmark Italian restaurant is a great option for an extravagant dinner out with your date. Enjoy incredible wines, a special ambiance, and incredibly rich pasta and seafood dishes. This incredible hotel will feel start to feel like home to you by the time that you leave. Incredible service, charming rooms, a beautiful and hidden-away location? There’s nothing not to love! This library was once the site of a fateful reunion between Edgar Allen Poe and his one-time fiancé. Not a fan of literature? You’ll still feel nostalgic walking in between these glorious stacks. While CAV may be located in an unassuming neighborhood, when you step into this restaurant, you’ll feel like you’re transported somewhere entirely new! The décor is incredibly unique, and the food is tasty and elegant. Come through for dinner and try the diver area scallops and shrimp! Head to Prospect Park at night for an unbeatable view of downtown Providence! Overlooking the city from this peak, you’ll feel like you’re on top of the world. Enjoy the city lights at night, too. Book a room at this hotel and you’ll feel like you’ve stepped into another time. The rooms are beautiful, with marbled bathrooms and historic furniture. Take a walk around the outdoor gardens that surround the property, too!